Critics say that Corporate CEOs should be paid like professional athletes because sports is a more efficient labor market and athletes are paid fairly because they are compensated for their own talent. We disagree! We think professional athletes should be paid more like CEOs because CEOs have much lower fixed pay, have considerably more pay at risk, and have compensation incentives more aligned with a companys owners compared to the pay of the highest-paid athletes. I can clearly remember the first major league baseball game my father took me to  the Cardinals versus the Giants at Sportsmans Park in St. Louis. Each team had a superstar: The Cardinals had the legendary Stan Musial, and the Giants had the incomparable Willie Mays. The Giants won that game 4-0, and both superstars lived up to their reputations with two hits each. In the mid-1950s, baseball stars like Musial and Mays earned salaries of about $100,000 per year. That salary level was considered astronomical for that era. Today, however, baseball superstars earn considerably more for their services. And they are not the only athletes to earn millions: football, basketball, hockey, golf, tennis and soccer all have superstars who have compensation opportunities that provide multi-million dollar pay annually. Professional sports are now big business, with a highly competitive open market where skills and services are subject to negotiation and contractual agreements between sports club owners and athletes. Most observers do not criticize highly paid athletes for their compensation levels unless there is a significant shortfall in performance. Lets compare the compensation package of a superstar athlete with the pay of a CEO engaged in the day-to-day management of an S&P 500 company. 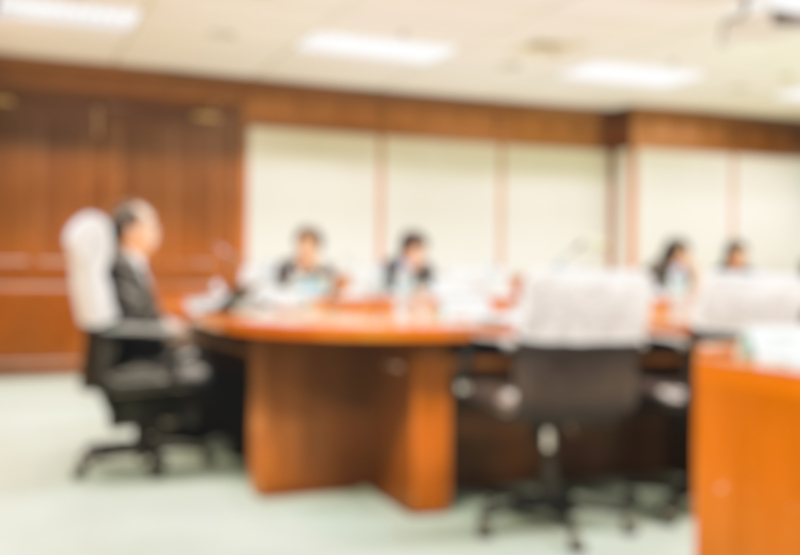 Like the superstar athlete, the CEO participates in a highly competitive labor market and exists in his or her role at the discretion of a companys board of directors. Although the CEO depends somewhat on the skills of others for his or her success, he or she can single-handedly have a tremendous impact on the creation of shareholder value. In todays business environment, the CEOs pay package is subject to considerable scrutiny and frequent criticism. How does the typical CEOs compensation stack up against a superstar athletes? To make the playing field level, we will compare the pay of an S&P 500 CEO at the 90th percentile with the pay of a superstar athlete. * We will show how the CEOs compensation is subject to greater performance requirements and less downside protection, and is more directly aligned with the returns earned by the companys owners. 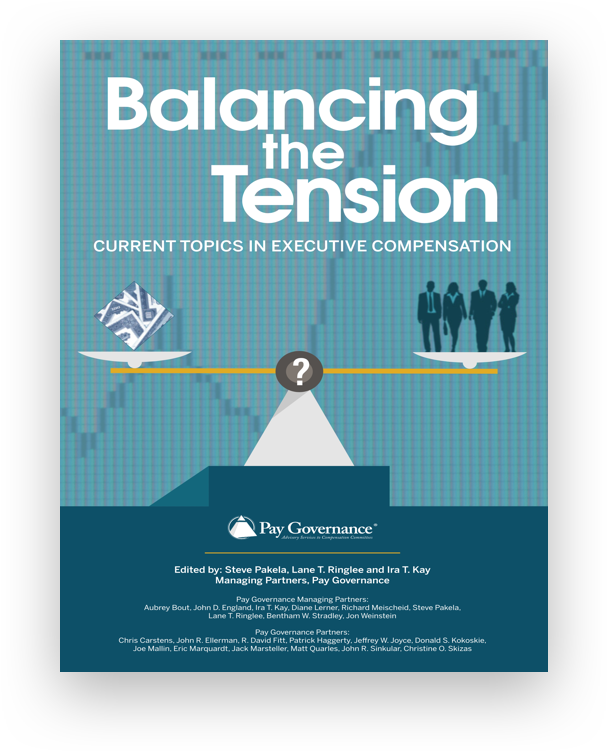 We hope this comparison will illustrate how much risk and performance orientation is embedded in the compensation arrangements for highly paid corporate executives, as well as the challenges facing corporate boards seeking to structure proper executive compensation programs. Albert Pujols led the St. Louis Cardinals to a big win in the 2011 World Series, capping a successful career during which he had great personal success while leading the Cardinals to two world championships. Pujols began his major league career with the Cardinals in 2001 and played for St. Louis for 11 years. In 2011, he earned a reported $16 million playing with the Cardinals. Following the 2011 World Series, Pujols exercised his rights as a free agent under the collective bargaining agreement of the Major League Baseball Players Association, and negotiated with several teams, including the Cardinals, for a long-term contract. After extended negotiations and much publicity, he signed a 10-year contract with the Los Angeles Angels of the American League with a reported value of $240 million. After the details of the contract were reported, the value of the deal turned out to be more generous than the reported $240 million. In Table 1 below, we show Pujols salary year by year for the next 10 years with the Angels and the contracts total value of $240 million in salary. Although it seems pretty generous (we do not know of any CEO who has a fixed base salary of $12 million annually and a guaranteed contract term of 10 years with ever increasing base salary rates! ), the Pujols contract is loaded with additional incentives and opportunities for him to earn more each year than the stipulated salary amount. These incentive opportunities are referred to as milestones and bonus opportunities in the contract. They are described in Table 2 below. 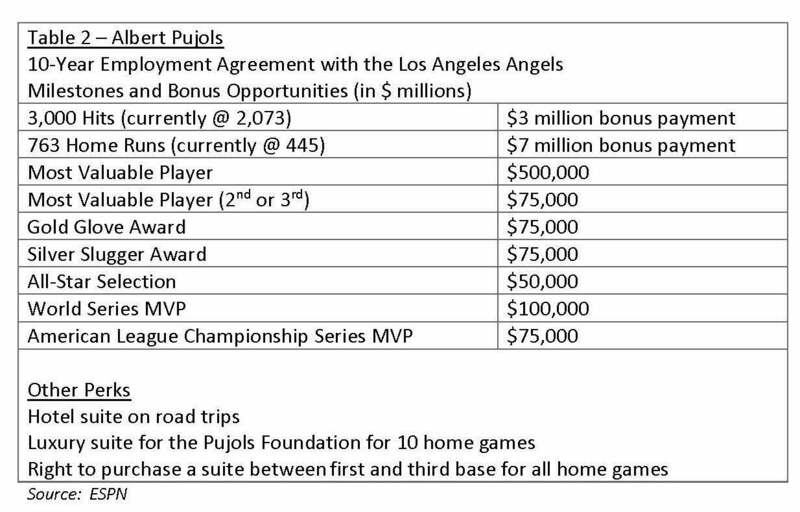 On top of the milestones and bonus opportunities described above, the Pujols contract specifies that he cannot be traded to another team without his consent. Additionally, there is a lucrative personal-services provision in the agreement whereby he is entitled to a 10-year consulting arrangement with the Angels organization at the conclusion of the contract term at the stipulated rate of $1 million per year. Pujols got off to a slow start with the Angels in 2012, considering his new compensation package. As this piece was being written, Pujols had played 95 games with the Angels with a batting average of .280, 18 home runs and 60 runs batted in. This level of performance lags his performance statistics with the Cardinals, where he was a consistent .300 hitter with 40 home runs and 100-plus runs batted in each season. Certainly, the Angels are counting on Pujols to regain his historical form and lead the team to pennants and World Series opportunities. An interesting side story to the Pujols contract involves the decision by the Major League Baseball (MLB) players union and Major League Baseball to ban all personalservice arrangements and milestone bonuses in future agreements. This occurred after the signing of the Pujols contract. The players union and Major League Baseball made August 2012 - 4 -this decision because such provisions raise issues under the terms of the basic agreement between the players union and Major League Baseball. Major League Baseball is trying to close loopholes under which teams can sign high salary players with contract language that allows teams to avoid paying luxury taxes. Bonus amounts and personal service contracts are not included in payroll calculations since they are considered not to be guaranteed money. The players union and Major League Baseball believe that contracts that are extended beyond a players career violate the basic agreement. In contrast to the compensation package of Pujols, lets examine the compensation arrangement of a typical CEO of an S&P 500 company. To assess the pay package of an S&P 500 company CEO, we have referred to the 2012 S&P 500 CEO Pay Study by Equilar, Inc., the California-based compensation survey and research firm. Equilars analysis is based on proxy data reported for 323 chief executives at 322 companies in the S&P 500. The Equilar analysis includes only CEOs who had been in place for at least two years. Only 8.0%, or approximately $1,400,000, of the CEOs compensation is fixed in the form of base salary. Approximately 92% of the CEOs compensation is in the form of variable compensation: bonus, stock options and other stock-based incentives. Equilar further reports that the use of different types of stock-based incentives continues to increase. In 2011, Equilar notes, 75 of the 323 CEOs studied received longterm equity compensation in the form of three stock-based vehicles: stock options, restricted stock, and performance shares. Fewer than 25% of the CEOs in the Equilar study received this long-term equity award in the form of a single stock-based vehicle. When the Los Angeles Angels signed Albert Pujols, the owners of the baseball club were making a long-term bet on his ability to fill more seats and generate more fan enthusiasm. A simple economic analysis explains the dynamics of his contract and the financial considerations embedded in the signing of a superstar athlete to a long-term contract and the contracts possible impact upon a team's financial fortunes. Let's assume that the signing of Pujols results in the team's filling 5,000 additional seats for each home game. Each major league baseball team plays 81 regular home games per season. Assuming an average seat price of $50, the additional revenues attributed to Pujols are estimated to be $20.3 million in the first year. Assuming that he continues to perform, and that the 5,000 incremental seats can be attributed to his performance each year for the 10-year life of his contract, the expected additional revenues for the Angels over the next 10 years would be approximately $232 million (assumes a 3% increase in seat prices per year). Undoubtedly, the Angels are counting on Pujols to help sell more beer and hot dogs at each game, in addition to generating additional television revenues. Although it is nearly impossible to calculate accurately the expected impact of the additional revenue stream beyond the additional attendance, let's conservatively estimate that the additional revenue from concessions and broadcast rights results in a doubling of the seat revenue. Thus, a conservative estimate may be that the Pujols agreement will trigger an additional $450 million to $500 million in direct revenues over the course of the contracts 10-year life. Is this level of financial impact sufficient to warrant a $240 million contractual agreement? Certainly, the Angels owners must be counting on post-season play, World Series opportunities and other considerations for maximizing the leverage associated with Pujols contract. 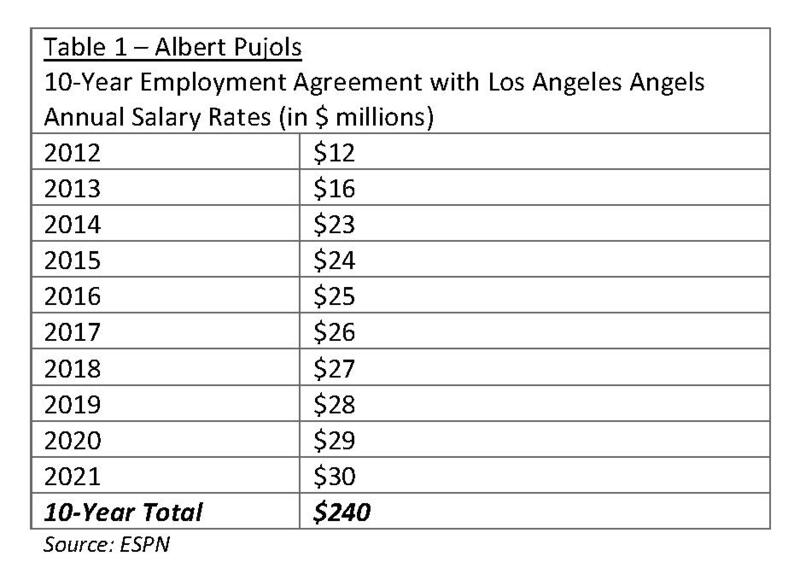 Now, let's compare the financial dynamics of the Pujols pay package with the compensation of the S&P 500 CEO. A simple analysis of the CEO's total pay would be to look at the $17.6 million total compensation in the first year and to grow that value by an assumed growth factor over the next 10 years. 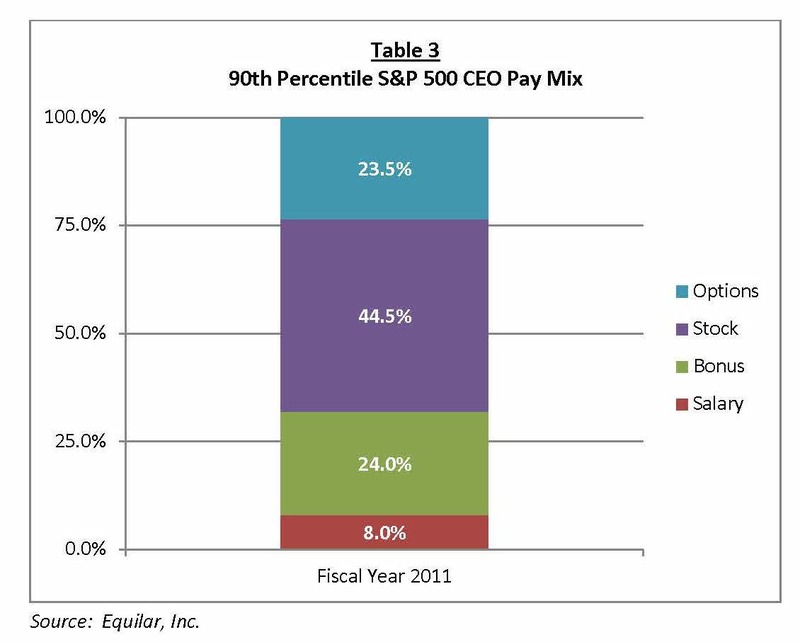 Equilar reports that the median compensation for the S&P 500 CEOs grew by 6.2% from 2010 to 2011. The 2011 growth in pay was an increase for the second consecutive year, after reported declines over the previous two years. For the purpose of our analysis, we have assumed an average annual growth rate of 3.5% in total compensation for the next 10 years. Assuming a compensation level of $17.6 million in year 1, the CEOs total compensation would be $206.5 million cumulatively over the 10-year period. This would be approximately $33.5 million less than the $240 million Pujols is under contract to earn for the same 10-year period. An aspect of competitive pay assessments that is often overlooked is that CEO compensation reported in the summary compensation table of a proxy statement is in large part the total pay opportunity, not realizable pay. The stock-based compensation elements in the proxy-reported data represent the expected value of stock options, restricted stock, performance shares and other stock-based elements based on the terms and conditions of such awards at the date of grant. Realizable pay represents the stock-based compensation potentially earned by an executive over a stated period based on the intrinsic value of the gains that could be realized from the exercise of stock options and gains from other stock awards at the end of the assumed performance period. The difference between pay opportunity and realizable pay is that realizable pay introduces stock price performance into the equation. Hence, it yields a better picture of the pay/performance relationship. 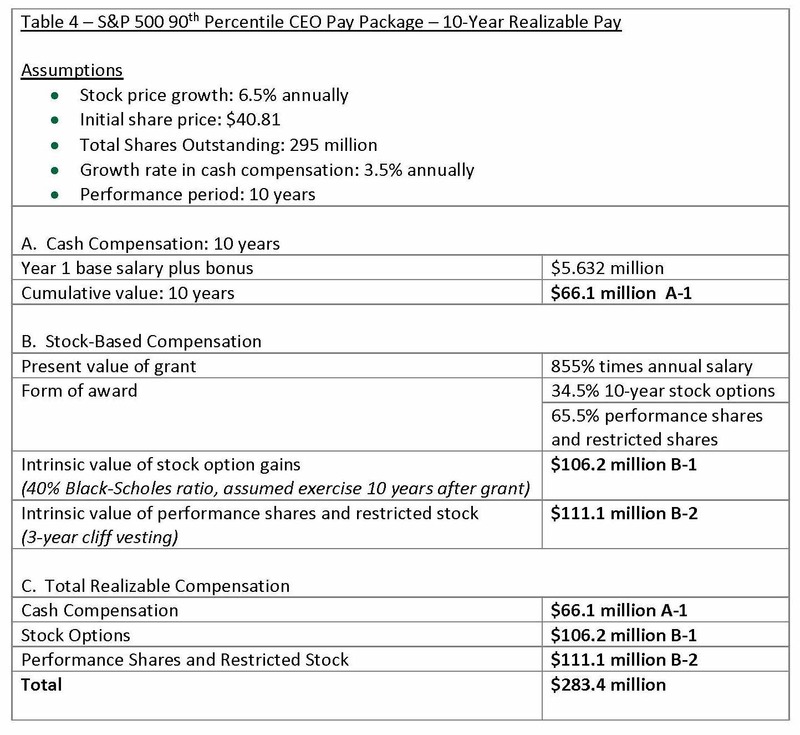 Let's use a realizable-pay analysis with the S&P 500 CEO to illustrate the performance requirements and inherent leverage embedded in the typical CEO compensation package and contrast these performance considerations with the pay package of the superstar athlete. For purposes of this analysis, lets assume that our CEO works for a hypothetical S&P 500 company, ABC Widgets, and that ABC Widgets has the financial profile of the median S&P 500 company as of the writing of this article (July 2012). The profile of ABC Widgets includes a market capitalization of $12.039 billion with a share price of $40.81, and 295 million shares outstanding. With this information and our knowledge of the CEO's pay package, we can develop a total realizable pay scenario based on the following assumptions and analysis (see Table 4 below). Over this 10-year period, the S&P 500 CEO will have earned $283.4 million in direct compensation. At the same time, assuming the same 6.5% growth rate in company share price, the company's shareholders will have received a $9.2 billion gain in shareholder value. The CEOs pay over the sustained 10-year period is only marginally higher than the fixed pay of the superstar athlete ($283.4 million versus $240 million), yet the shareholders of the S&P 500 company will have received a far superior return on investment compared with that of the baseball team owners. Eight percent of the corporate CEOs pay package is fixed in the form of base pay, whereas 92% is incentive-based, tied to performance metrics that are aligned with shareholder interests. More than 90% of the superstar athlete's compensation is fixed, with scheduled adjustments occurring each year, with increasing scale. The CEO's compensation is highly leveraged, with commensurate upside potential and downside risk, whereas the superstar athletes pay opportunity has little or no inherent leverage and provides more downside protection. The superstar athlete has a 10-year contract backed by working-condition requirements and other provisions negotiated by his union, including a no-trade clause. 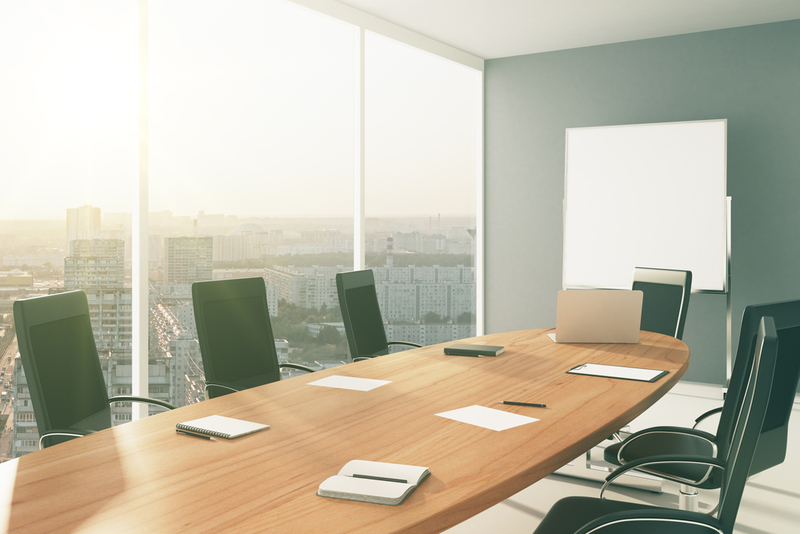 The CEO can be terminated by the company's board at any time, and his or her severance package will likely be highly scrutinized. Shareholders in the large public company are the big winners if the CEO can deliver sustained performance over an extended period, and will capture a much higher return on compensation investment than will the owners of the baseball team. We believe that there are a lot of positive features to the design of the typical corporate CEO compensation arrangement. 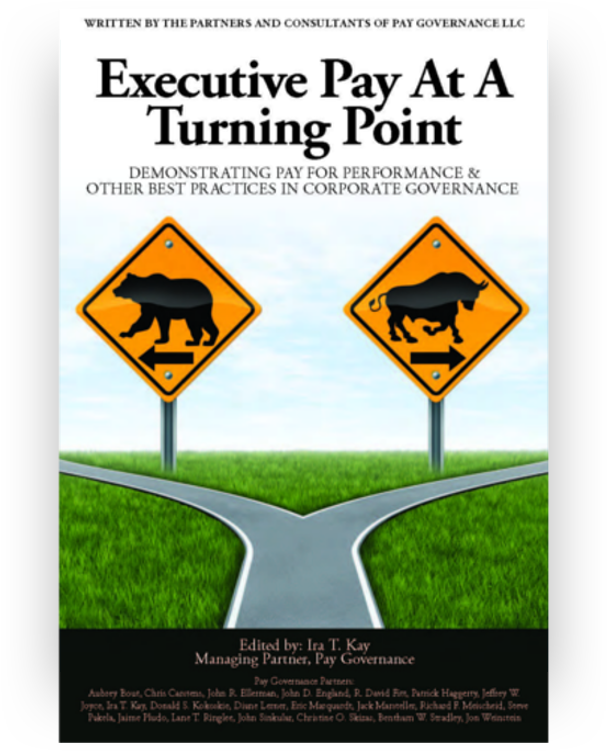 In recent years, companies have taken many steps to improve the pay-for-performance alignment in consideration of shareholder interests. Compared to the pay packages of superstar athletes like Albert Pujols, the current average CEO's pay package outshines that of the baseball star in terms of design, reasonableness and prospective return on investment.